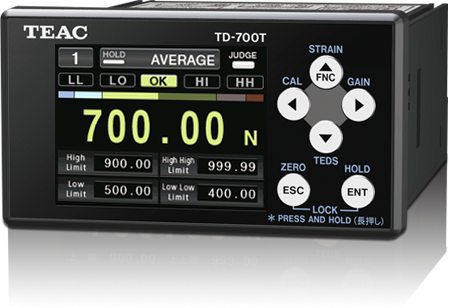 TD-700T is a digital indicator to measure and display physical quantity such as load, pressure, and torque working with strain gauge transducer. Color graphic LCD display, high-speed sampling, TEDS function (IEEE1451.4 class 2 mix mode interface compliance) and various hold functions are combined into this compact panel mount display (1/8 DIN size). The TD-700T provides the best performance in the various scenes. Vivid display gives immediate process status. Each alarm intuitively and independently advises process condition. The home screen can be selected from "standard", "bar meter" and "indicator value", and also can be customized tailored to your applications. The fast 4Ks/S sampling rate shows the process levels vividly and in real time. The TD-700T shows what happens before, during and after any event. A variety of display modes is available to meet your purpose. Switchable between the 5-digit digital display that enables direct reading of physical quantities up to ±99999 and the bar meter display that shows an analog representation of the indicator value. Sampling and response times of 4000 per second. You can realize higher measurement accuracy and reliability with faster sampling of 20,000 cycles/s in Fast mode. TEAC load cells and digital indicators are compatible with TEDS (Transducer Electronic Data Sheet) which is a format defined in the IEEE 1451.4 standard. Support for TEDS sensors makes calibration easy. Automatic calibration is also possible when a TEDS sensor is connected. 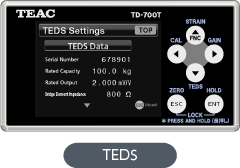 TEDS compatible sensors store specific information that contains the model number, serial number, sensitivity, calibration information, and so on in its memory. The data written in "TEDS data rewrite" is returned to the calibration value at the time of product shipment. Allows the measure static strain. This function makes it easier to check load-cells for deterioration plastic deformation. 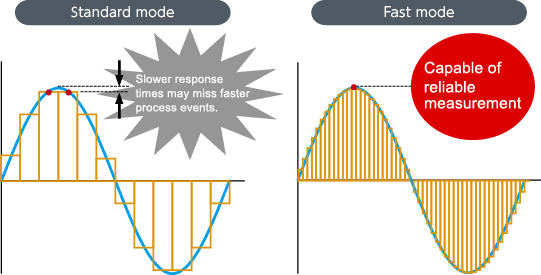 Waveform display function allows input signals to be checked as waveforms. This graph shows the indicator value as the vertical axis and the time as the horizontal axis. A variety of holdong functions can be activated utilizing the front panel controls or external control signals. 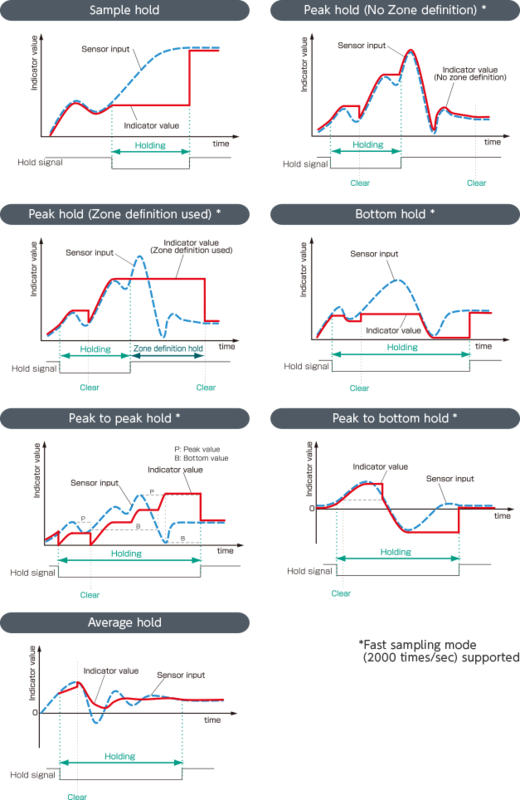 It supports a variety of hold functions, including peak hold, bottom hold, peak to peak hold, and these holds with zone designations. The TD-700T optionally supports CC-Link and RS-485 interfaces for easy connection with production lines and other systems. A warning function is installed. Easy to understand when a problem occurred, equipped with a warning function. Compensates for possible voltage changes due to temperature fluctuations and/or extended cable lengths without the lose of accuracy. ※Since the remote sense function and the TEDS function share the pins, they can not be used together. Zero position for the bar graph can be set automatically depending upon the application.